Mass Deployment Splashtop Streamer - Splashtop Inc. Easily deploy your customer streamer or switch all your managed computer to Splashtop. 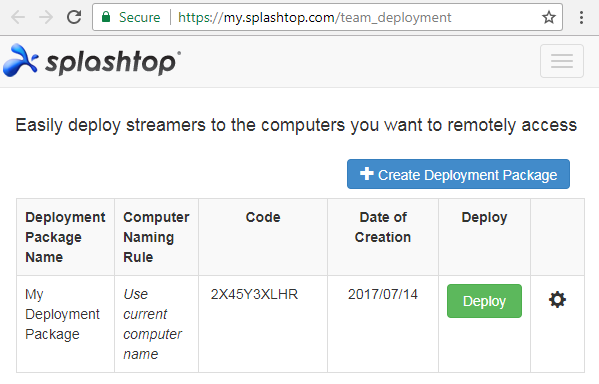 If you are using Splashtop Remote Support, here are the simple steps to deploy your custom streamer to the computers you want to access. Already using another remote access solution? it’s easy to make the switch to Splashtop. 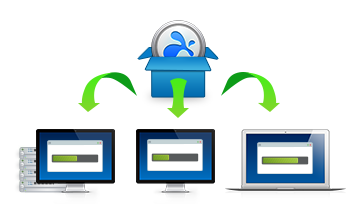 Splashtop streamer is the software that runs on the computers you want to remotely access and manage. Log into your Splashtop web console and create a deployment package. Then you can download the installer as an EXE or MSI. Click here to learn more on how to get this set up. To install Splashtop remotely, use your existing remote support tool to remote into your computers. Download the streamer installer onto those remote computers, then run the installer. If you have Microsoft Group Policy, SCCM, or a RMM tool, you can install the streamer onto many computers in one shot by using MSI or EXE. The installation process with both MSI and EXE installers can be customized for silent install and more by adding command line parameters or editing the MSI. Here is an overview of the various deployment methods. If you currently have LogMeIn Central, you can use its One2Many feature or command prompt to silently deploy Splashtop without remoting into the computers. See these instructions if you’re deploying via Apple Remote Desktop. You’re welcome to take a look at our brief tutorial video or give our support team a call. How do I create deployment packages? How do I customize the default streamer settings for deployment? Don’t have Splashtop yet? Get started with a free trial of Splashtop Business Access, Splashtop Remote Support or Splashtop On-Demand Support.